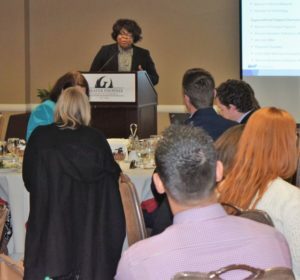 On Tuesday, Carrie Young, Senior Director of Corporate Operations Services for Salt River Project (SRP), spoke at the Professional Women’s Alliance luncheon. 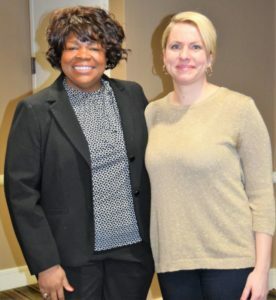 She shared her unique career journey including her transition from the military into the civilian workforce. Addressing a vibrant crowd of professional women, Young discussed her keys to success and explained how her history shaped her future. Through her experiences with my family and the examples set in front of her illustrated the importance of values and established her own core values of trust, responsibility, accountability, and service. Young is an Air Force Veteran, and her background and experience as a veteran shaped her leadership style and career pathway in unimaginable ways. Her time in the military and her time as a young girl, instilled her with a tenacity and perseverance to keep going. Leaving her military career behind after 20 years, Young transitioned into the civilian sector with vigor and positivity that she tackled every opportunity. Under her leadership, she was able to positively impact her organization by hitting new marks of success in her industry and building connections within her organization. “One thing I’ve learned is that you have to have the stamina and you have to have a vision,” she said. According to Young, it’s also vital that leaders lean on their team to enact a vision and serve their team by being aware and supportive to those they supervise. In her life, career and community are two key pillars that have motivated her to grow and prosper. “Community involvement is a great way to grow in your own development, expand your network, and build relationships and to feel good about contributing and giving back,” said Young. Young has more than 30 years direct experience across a range of military and utility activities. Carrie is the Senior Director of Corporate Operations Services for Salt River Project. Sher serves several community organizations, which include the following: the City of Phoenix Veteran Commission, the Better Business Bureau of Central, and the Western Energy Institute (WEI) Corporate Services Board, and several other organizations. She holds a Bachelor of Science degree in Computer Science from Chapman University and a Masters Degree in Information System Engineering.